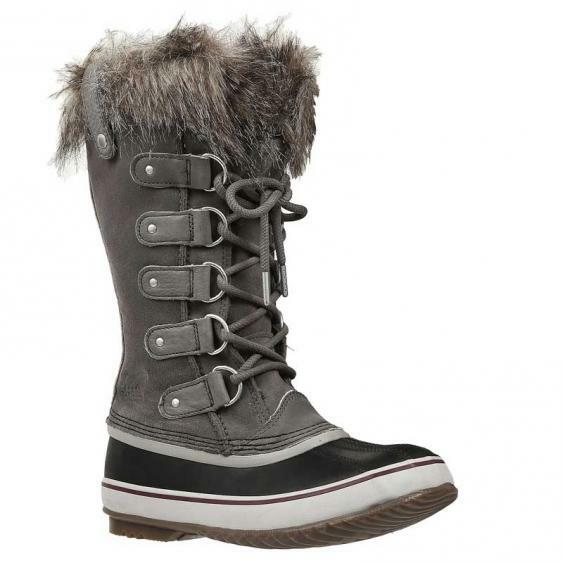 The Sorel Joan of Arctic has found its place as a cold weather classic, and for good reason. This women's winter snow boot features a waterproof full-grain leather upper or suede, with a faux fur cuff to keep out the snow, and add iconic style. The sleek and feminine design is complimented with contrast laces, and the D-ring eyelets help you easily lace up for a perfect fit. Seam-sealed, waterproof construction keeps out the cold AND the elements, while the removable and washable 6mm recycled felt inner boot keeps your toes toasty warm. The midsole features a 2.5 mm bonded felt frost plug to keep from getting "cold spots" at the pressure points of the boot. The handcrafted, waterproof, vulcanized rubber shell is another line of defense against the elements, while providing reliable traction thanks to the herringbone outsole. Whoever said fashion and function can't combine, never saw the Sorel Joan of Arctic boot.